Secret Ice Skill: Flying Water Needles (50 Chakra)Multi-Hit 100 Life Damage,cant interrupt. Secret Ice Skill: A Thousand Needles of Death (100 Chakra) Multi-Hit 200 Life Damage, Cant be guarded/interrupted. If Avoided, Demonic Ice Mirrors will cost -50 Chakra if made on the square. Agility Boost (25 Chakra,25 Stamina) Select One Mirror, At the Beginning of the Turn,you are at the current square by the end of your turn, you are at the targetted square. *Secret Ice Skill:Demonic Mirrors:Needle Strikes (Static) All Needles Thrown From Mirrors cant be Dodged and Guarded/Interrupted by Taijutsu. *Secret Ice Skill: Demonic Ice Mirrors;Shield (200 Chakra) Avoids One Technique from the opponent's last post,including Inevitables. Mirror is Destroyed.3 times per battle. *Secret Ice Skill: Mirror Master Imitation (100 Chakra,passive) Player May Throw one or more Items from Any/All Mirrors at once. Limit is 3 Throwing Items per mirror. once every three turns. Secret Ice Skill: Raining Icycles (200 Chakra) 250 Life Damage,Bleeds 50 for 3 Turns; Enfeebles 50 for two turns. Cant Dodge/Guard/Interrupt. *Secret Ice Skill: Hardening Ice Mirrors (50 Chakra per 50 DP) Regain ### DP for Mirrors. cant interrupt,once every five turns. 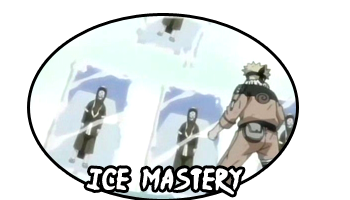 *Secret Ice Skill: Crystal Ice Mirror Reflection (150 Chakra) Reflects Any/All Genjutsu excluding inevitables Back to the Caster,twice every 4 turns. Secret Ice Skill: Ice Spires (150 Chakra) Multi-Hit 300 Life Damage,Berserks 100 for 2 turns; cant interrupt/block. *Secret Ice Skill: Exploding Demonic Ice Mirrors (250 Chakra) ### Life Damage= Mirrors DPx2. inevitable.twice per battle. * Requires Ice Mirrors to be in play. -A max of 5 Ice mirrors can be on the battlefield at once.